"sein & zeit #3: information & technology" is a third realization of the "sein & zeit" project and is based on the results of the preceding two works; "sein & zeit #1: mass & media" (2001) and "sein & zeit #2: virtuality & reality" (2003). In the "sein & zeit" project, we use real-time television broadcasts as our material, and deconstruct and reconstruct them as a percussion performance with video images and sounds. Each percussion instrument is allocated a particular function and the performer can execute those functions, for example, television channel change, brightness and volume control, audio-visual sampling and playback. Our new approach in "sein & zeit #3: information & technology" is to present multiple images/sounds at the same time. Multiple images/sounds enable us to express not only a time-based composition but also the extensity and relationship of materials. For this purpose, we will use two video projectors and two projection screens. But we can also combine them in the computer and use only one projector and one screen. The words "Sein und Zeit," the title of a book by M. Heidegger, have been adopted as the key words of this project. Distinct from their usage in the publication, they represent an attempt to consider what forms audio and visual information take when accompanied by a time axis, and how they are interrelated; this with respect to how humans appreciate information that is a reflection (phenomenon) of our computerized existence. By means of breaking up the continuity of an image, and placing a subject on a different time axis, this project attempts to expose a segmented time gap to an audience who see a continuous image that constitutes thirty still frames a second. It is also an attempt to explore the interactive potential of audio and visual information systems and physical beings that exist in real time, when the systems themselves are on a different time axis. The system of this work consists of two parts. One is a percussion detector and the other is a TV-controller. They are realized with computers, peripheral devices and several software engines that are programmed in C language. Max/MSP/Jitter programming environment is also used as a front-end. The percussion detector decides which instrument is hit using an audio signal analysis of contact microphones that are attached each instruments. We use not only a signal level analysis but also a signal frequency analysis so we can get various tone alterations of one instrument. The TV-controller controls a receiving channel, brightness and volume of a television tuner. It is also able to record and play video images/sounds of television broadcasts. The images are stored in the computer's memory as thirty frames per second. The sounds are also stored together with the corresponding image frames. The stored images and sounds can be played back immediately. The percussion detection information is sent to the TV-controller and controls audio and visual processing of the television broadcasts. 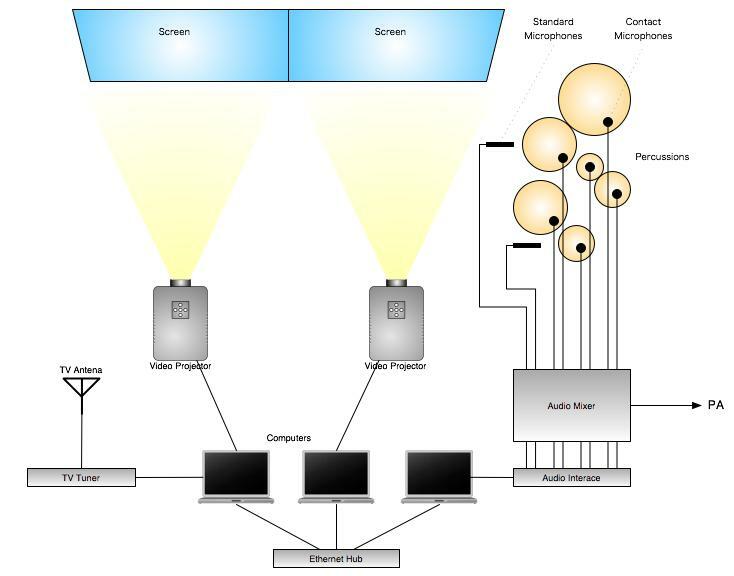 Thus the performer can control the video images/sounds of television broadcasts in various ways by hitting the percussion instruments. The performance consists of three parts. In the first part, the performer plays percussion instruments and changes the channel of television broadcasts that he receives. He also records the video images/sounds when he thinks proper. This is a sort of improvisation but we think of it as an activity to search for materials. In the second part, the performer plays music following a score and the recorded video images/sounds are played back. The score is notated using fixed rules and order. It is not based on a musical reason but on a systematic one that we can recognize materials and playing methods. The performer also has a chance to comprehend the results of his performance. The last part is an improvisation part without any scores. The performer should play according to his artistic sensitivity. But at the same time he must also combine percussion playing and the video images/sounds of television broadcasts. He will try to perform to make full use of the various effects and expressions. The approximate performance time is twenty minutes. In addition, we can give the audience the opportunity to try our system after the performance. Masayuki Akamatsu, a media producer, was born in Hyogo, Japan in 1961. He studied psychology at Kobe University and began to produce audio-visual artworks with computer in his undergraduate days. Currently, he is a professor at IAMAS (International Academy of Media Arts and Sciences). He has produced many works in media art that employ computer and networking facilities, focusing on the relation between an artwork and the audience and the autonomy of an artwork itself. His works include: "incubator" (2000), which projects audio-visual events with fifty computers; "Time Machine!" (2002), which visualizes the audience's experience of time in real time; "Flesh Protocol" (2002), which controls the performer's body with a computer. Akamatsu is also active in performing live electronic music. He has not only soloed but also participated in many sessions. He has published many books and organized events including "DSP Summer School". His writings include "Trans Max Express" (Ritto-Music, 2001, co-author) and "Cocoa+Java" (Kobun-sha, 2001). Satoshi FUKUSHIMA, a composer, was born in Niigata, Japan in 1977. He studied music at Niigata University Faculty of Education (1997-2001) and is studying music and programming at Institute of Advanced Media Arts and Sciences (IAMAS, 2002-). 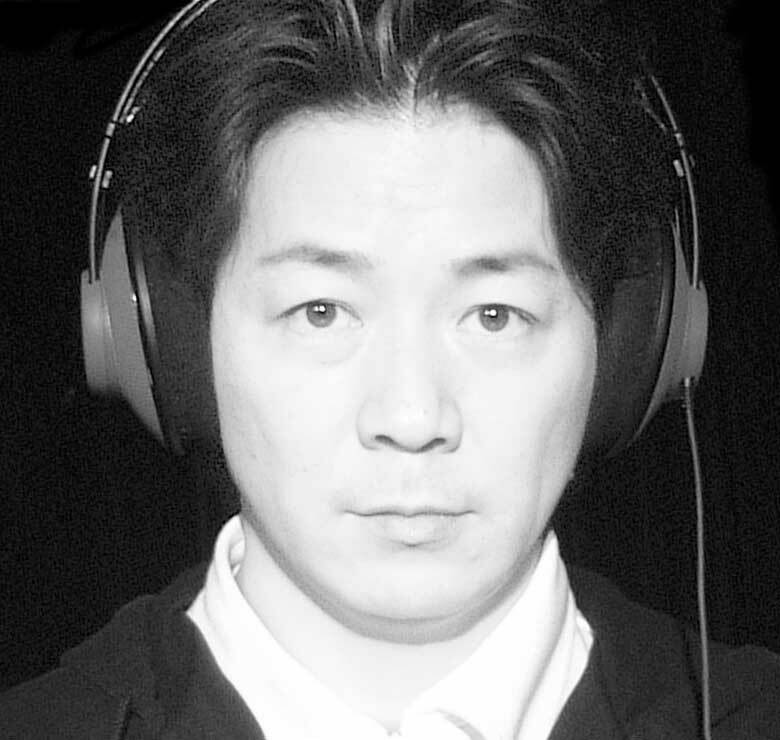 He has composed some works in live electronic music. 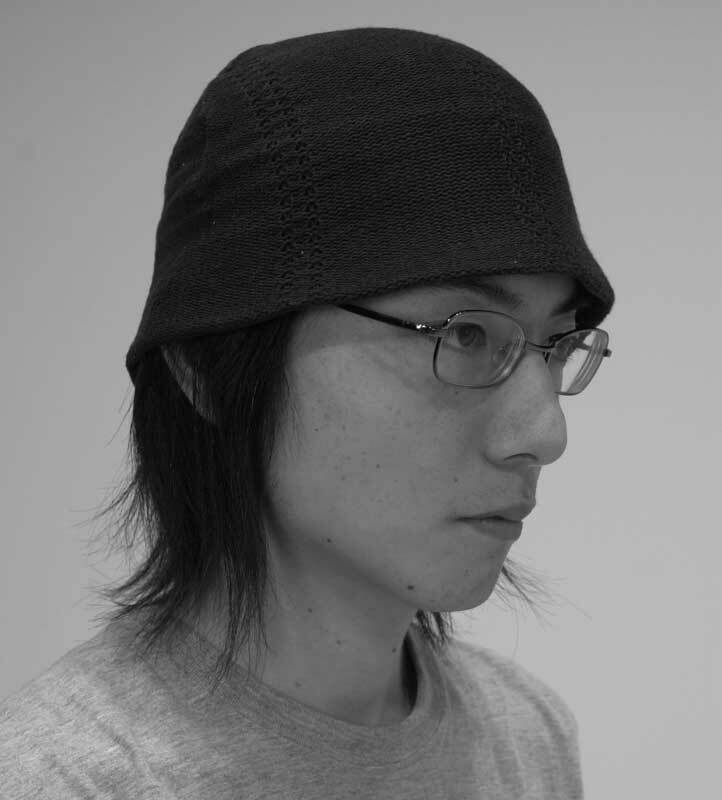 His works include: "teo" (2002), which is played on a piano using a real time sampling system; " c.hc.hch. "(2003), which is played by a tape-player, piano, and MIDI keyboard with a high-speed audio-channel switching system.